Background: Drug abuse is one of the most prevalent public health problems around the world and Iran too. Drug abuse is influenced by various psychosocial factors. This study aimed to explain the relationship model of drug abuse based on perceived criticism, mindfulness, and emotion regulation in Isfahan male adolescents. Methods: This was a correlational cross-sectional study. A total of 350 male students were randomly selected from different high schools in Isfahan during the period of 2015–2016 academic year. Four questionnaires including the probability of drug abuse questionnaire, emotion regulation inventory, Mindful Attention Awareness Scale, and perceived criticism scale were employed. Data were analyzed using Chi-square and correlation coefficient, besides; Structural equation modeling was used to model the direct and indirect relationships between variables. In this regard, SPSS and AMOS softwares were used. Results: Out of the whole subjects, 49.7% had score above the median, indicating more likely to be drug abuser. There was a significant correlation between emotional reappraisal (r = −0.40), expressive suppression (r = −0.38), mindfulness (−0.57), and criticism (r = 0.57) with drug abuse among male adolescents (P < 0.001). 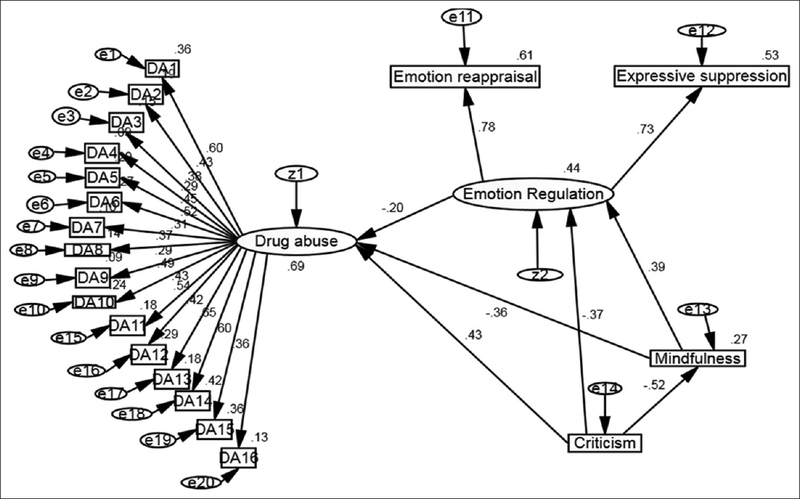 Moreover, criticism through the emotional self-regulation had indirect effects on drug abuse. Totally 69% of the variance in drug abuse was explained by the study variables. Conclusions: In total, the results of this study revealed that high levels of drug abuse among students can be considered as a crucial issue, regarding the significant effects of psychological factors, adaptive emotion-regulation strategies, as well as school and family-based Psycho-social skills, are recommended. Background: Detecting pressure ulcer is an important nursing diagnostic and care requirement in patients hospitalized in Intensive Care Unit (ICU). The purpose of this study is to examine the effect of Lawsonia plant on pressure ulcer grade one in ICU patients. Methods: In this clinical trial, 72 patients eligible for hospitalization in hospitals of Isfahan University of Medical Sciences were divided randomly into two control and intervention groups. The standard program of skin care was implemented on both groups; in addition, a mixture of Lawsonia (henna) and distilled water was applied topically in the intervention group. The classification form of the International Pressure Ulcer Advisory Panel was used to identify grade one ulcers. Data were collected on the 1st day through demographic information questionnaire and Braden pressure ulcer risk assessment scale. An infrared thermometer was used to record local temperature of the ulcers on a daily basis. Assessments were made based on Pressure Ulcer Scale for Healing (PUSH), and the pressure ulcer area was examined per square centimeter on the 1st, 4th, and 7th days. The data were analyzed using SPSS 16. Results: The average change in the ulcer area per square centimeter in the control group increased by 29.9 ± 37.93 whereas it decreased by 3.54 ± 33.91 in the intervention group. The mean PUSH score decreased in the intervention group (5.36 ± 3.12) while it increased in the control group (1.91 ± 1.53). The average changes of PUSH score before and after the intervention showed a significant difference in both groups. Conclusions: With regard to the effect of henna on the reduction of ulcer area and the average PUSH score in ICU patients, the application of henna is recommended for healing grade one pressure ulcers. Original Article: Does chorionic villus sampling increase the risk of preeclampsia or gestational hypertension? Background: Chorionic villus sampling (CVS) and amniocentesis are two methods for prenatal diagnosis. The goal of this study was to compare amniocentesis and CVS-related complications in a large sample of Iranian women. Methods: Medical records of 1624 women who underwent amniocentesis or CVS due to medical indications between 2008 and 2016 were reviewed. Data regarding age, gravidity, parity, gestational age, type of procedure, neonatal weight (and percentile), trisomia, abortion, intrauterine growth restriction (IUGR), severe IUGR, preeclampsia, and gestational hypertension were recorded. Results: Finally, 1215 cases were evaluated. Mean maternal age, gravidity, and gestational age were significantly different between two groups. Preeclampsia, gestational hypertension, IUGR, severe IUGR, and intrauterine fetal death were not significantly different between two groups. Trisomy 18 and 21 were common in cases underwent amniocentesis. Conclusions: Women who underwent CVS are not at higher risk for developing hypertensive disorders than women underwent amniocentesis. Background: Birth asphyxia is considered as one of the biggest challenges faced by perinatal care experts. According to the WHO, in 2005, one-fourth of infant mortality cases occurred due to birth asphyxia. Methods: This study is a retrospective study done on the newborn population with gestational ages of 36 weeks or higher during the years 2013, 2014, and 2015 to find the relationship between the number of birth asphyxia cases and the years. As a secondary objective, the relationship between the mode of delivery and the cases of birth asphyxia were investigated using logistic regression test. The inclusion criteria consisted of three cases, namely, gestational age of 36 weeks or higher, 5 min Apgar of <5, and umbilical cord pH of <7.1. The exclusion criteria involved hydrops fetalis, cyanotic heart disease, chromosomal abnormality, and congenital infections. Results: From the two independent variables of the study, only the variable “year” showed a significant difference between the years 2013 and 2015 (P < 0.01). The delivery mode did not have any statistically significant influence on the newborns' affliction with birth asphyxia (P = 0.993). Conclusions: According to the results, there is a significant difference between the rate of birth asphyxia in Iran and its global rate in 2015, and regarding its multiple growth from 2013 to 2015, conducting a more comprehensive and extensive research on birth asphyxia risk factors at a delivery time seems justified and inevitable. Lower extremity ulcers represent the most ominous, feared, and costly complications of diabetes mellitus. 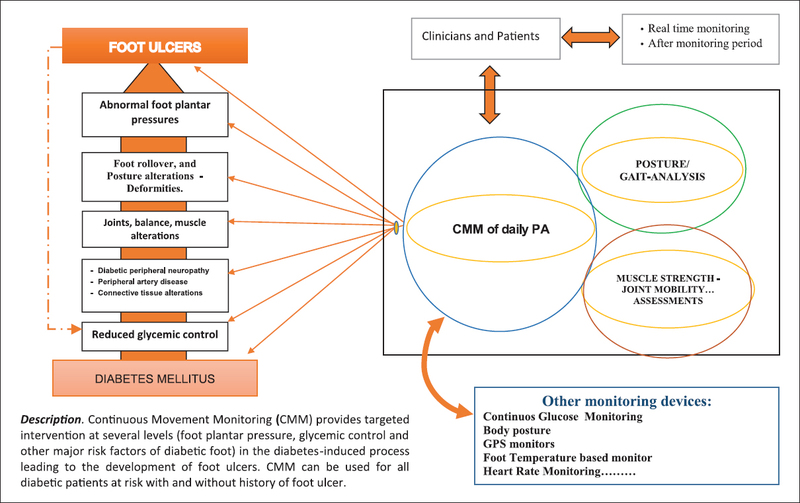 The aim of this review is to highlight the role of daily life physical activities (PAs) and continuous movement monitoring (CMM) in the prevention of foot ulcers. Peripheral neuropathy and peripheral vascular disease are the main causes of foot ulceration and contribute, in turn, to the development of additional risk factors such as foot deformities and/or joint and muscular alterations. Moreover, a deficit of balance, posture abnormalities, followed by gait alterations, increases the risk of ulceration. PA can play a key role in the management of patients with diabetes and in the prevention of ulcers; however, even if it has been reported that some of these risk factors significantly improve after a few weeks of exercise therapy (ET), the real preventive role of ET has not yet been demonstrated. These uncertain results can occur due to some limitations in the management of the same relationship between PA and diabetic foot prevention. Technological advances during the last years enable timely management of overall daily PA. The use of these modern technologies and devices allows CMM assessment and description of daily PA even in the long term. The data collected from these devices can be used to properly manage patients' PA and thus contribute to the prevention of foot ulcers. Our aims to examine the factors influencing self-care for the prevention and control of preeclampsia in high-risk women. 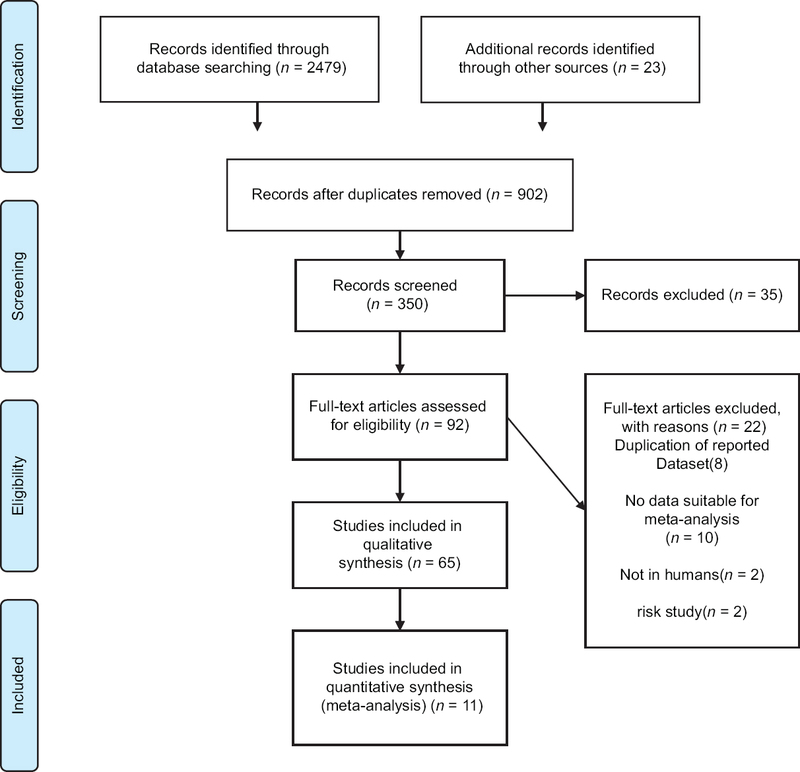 The current study is a review where the researcher browsed the available databases such as PubMed, Cochrane, Medline, Google Scholar, Medscape, and relevant research published between 1980 and 2016 were studied. To search for articles, relevant Medical Subject Heading keywords were first determined (Self-care, preeclampsia, prevention.) A total of 350 related articles were first selected, and the findings of 70 were used to compile the present article. The results of the study were classified under two general categories, including (1). Counseling and screening strategies and (2) self-care strategies for the prevention and control of preeclampsia in high-risk women. Screening women at risk for preeclampsia include measures such as measuring their blood pressure, checking for signs of depression, testing for thrombosis, taking a history of preeclampsia, providing preconception counseling about the appropriate age, time of pregnancy, and encouraging weight loss in obese women. This review showed a positive relationship between knowledge about self-care for preeclampsia and its control. The factors influencing preeclampsia self-care include making lifestyle changes, having a healthy diet, learning stress management, performing exercise and physical activities, taking antioxidants, dietary supplements, and calcium and adherence to aspirin and heparin regimens. There is a positive relationship between preconception counseling, screening women at risk for preeclampsia, self-care for the prevention, and control of preeclampsia. (1) Tweetable abstract self-care in high-risk women is strongly associated with prevention and control of preeclampsia. Background: Hemodialysis (HD)-associated ocular abnormalities are one of the causes of morbidity among people undergoing HD. This study evaluates the frequency of ocular abnormalities in end-stage renal disease (ESRD) patients undergoing HD and their potential link to HD and demographic parameters. Methods: This cross-sectional study examined 242 eyes of 121 patients with ESRD undergoing regular HD after excluding the ineligible subjects. The study was designed in two parts. Medical histories of each patient including age, gender, family history, medication history, past medical history, and duration of HD collected using a structured check list. All patients underwent complete ophthalmologic examination for evaluation of the best corrected visual acuity (BCVA), intraocular pressure (IOP), and anterior and posterior segments. Results: In total, 121 patients, including 68 (56.2%) males and 53 (43.8%) females, were enrolled in the study. The mean ± SD age of the patients and their mean duration of dialysis were 51.59 ± 16.01 and 3.40 ± 2.75 years, respectively. The most prevalent etiology for HD was diabetes mellitus (39.67%), followed by hypertension (38.84%), and the most common ocular findings included cataract (142 eyes; 58.7%) and ectopic calcification of the conjunctiva and cornea (78 eyes; %32.2). There was at least one abnormal ocular finding in 89.3% of the cases. The BCVA was equal to or less than finger count in 70 eyes (28.92%). There was a significant relationship between conjunctival calcification and the duration of dialysis (P = 0.02). There was significant association between etiology of HD and conjunctival calcification (adjusted odds ratio, 2.44; 95% CI, 1.05–5.67; and P value, 0.03). Such significant associations were present for corneal calcification (P = 0.009), cataract (P = 0.02), and optic atrophy (P = 0.01). Conclusions: Regular ophthalmologic examinations are recommended due to the prevalence of clinical ocular abnormalities in HD patients. Body image is the perception of individuals of their own body and it can be affected by many variables such as culture, social pressure, and media, but it is not limited to these factors. Body image disturbances are important because they lead to severe physical or psychological health problems. Development of body image dissatisfaction in Eastern communities has been increased in the past years. Despite many studies in Asian societies, In Iran, studies are scattered and limited. Our goal is a better understanding of this matter in Iran. 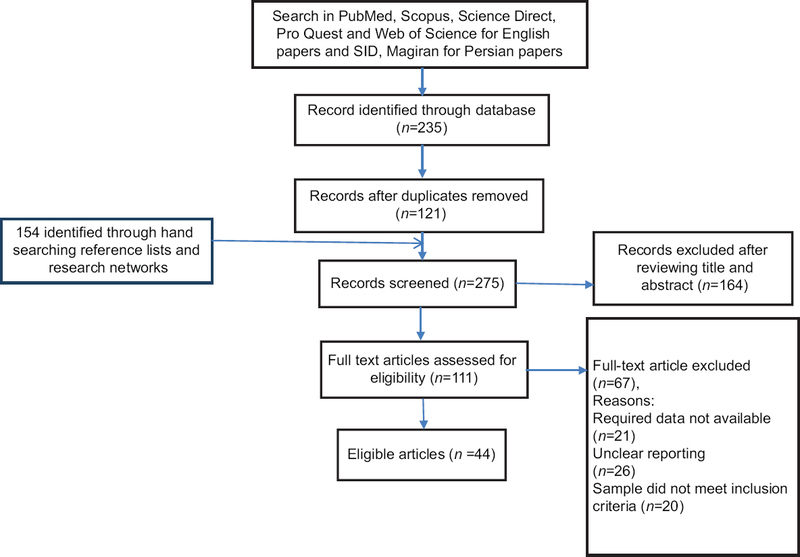 A review of scientific literature about Body Image and Iran was conducted inPubMed, Web of Science, Science Direct, Scopus, and ProQuest, also in Persian scientific databases such as Scientific Information Database (SID) and Thematic Guide to Iranian Publications (MAGIRAN). This search has been conducted in January 2018. Out of 389 articles, 44 of them were selected. In these articles, study period, sample characteristics, type of study, contributing variables, type of statistical analysis, and the main result of each article were extracted. Despite using different methods for detection of body dissatisfaction, results showed that this problem has a high prevalence in Iranian population. Contributing factors were also similar to the world findings. Review of studies regarding body dissatisfaction in Iran, revealed a high prevalence of this problem. It seems there is a need for interventional programs to prevent the negative consequences of body dissatisfaction, especially in teenagers and young people. Future studies with scientific or longitudinal design, which lead to better results, are recommended. Background: The aim of this study was to investigate the effect of hydroethanolic Nigella sativa L. extract on skin wound healing in diabetic male rats. 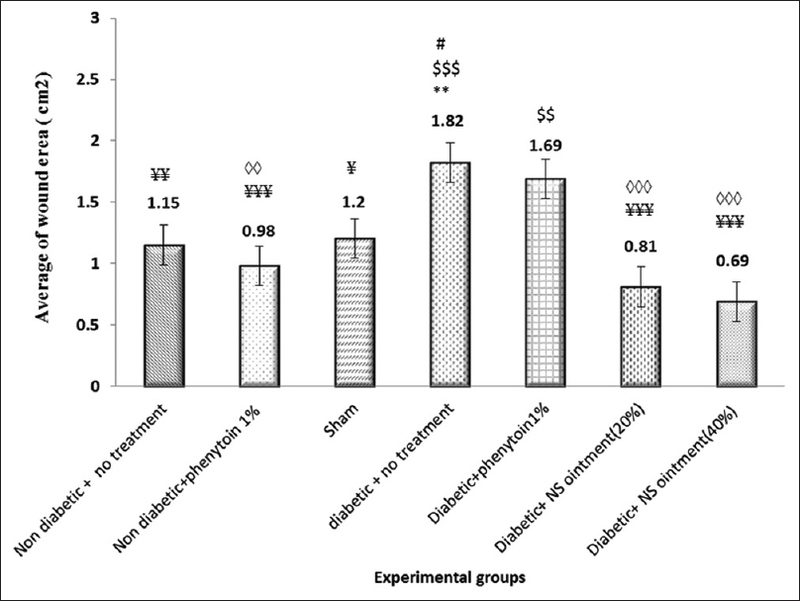 Methods: This experimental study was conducted on 49 male Wistar rats weighing 220–250 g divided into 7 groups of 7 each: control (nondiabetic untreated), sham (nondiabetic eucerin-treated), nondiabetic phenytoin (1%)-treated, diabetic untreated, and three diabetic groups treated independently with phenytoin 1%, hydroethanolic N. sativa extracts 20% or 40%. Diabetes was induced with 60 mg/kg streptozosin in one administration. After anesthesia, 2 × 1 cm2 wounds were made on the rats' backs and each group was administered with its own respective treatment until the wounds were healed completely. Tissue specimens were prepared for histological examinations. The areas of the wounds were measured every 3 days. The data were analyzed by ANOVA and Tukey's post-hoc test. Results: The mean duration of wound healing was 27 and 24 days for diabetic untreated and diabetic phenytoin-treated groups, respectively. Wounds were healed completely in nondiabetic untreated, sham, and nondiabetic phenytoin-treated groups on days 23, 24, and 21, respectively. The shortest duration of wound healing was seen in diabetic N. sativa extract (40%)-treated group (15 days) followed by diabetic N. sativa (20%)-treated group (18 days). These two groups were found to have the lowest mean wound area during the study with a significant difference from mean wound area in the controls (P < 0.05). Conclusions: N. sativa extract significantly promoted wound healing in diabetic rats in comparison with control groups. Although the beneficial mechanism of the promotion of wound healing was not specifically studied, it is believed that the anti-inflammatory and antimicrobial properties of N. sativa would contribute to this enhanced wound healing. Background: Vitamin D plays an important role in nervous health and depression. Vitamin D deficiency and anxiety affect diabetic status. 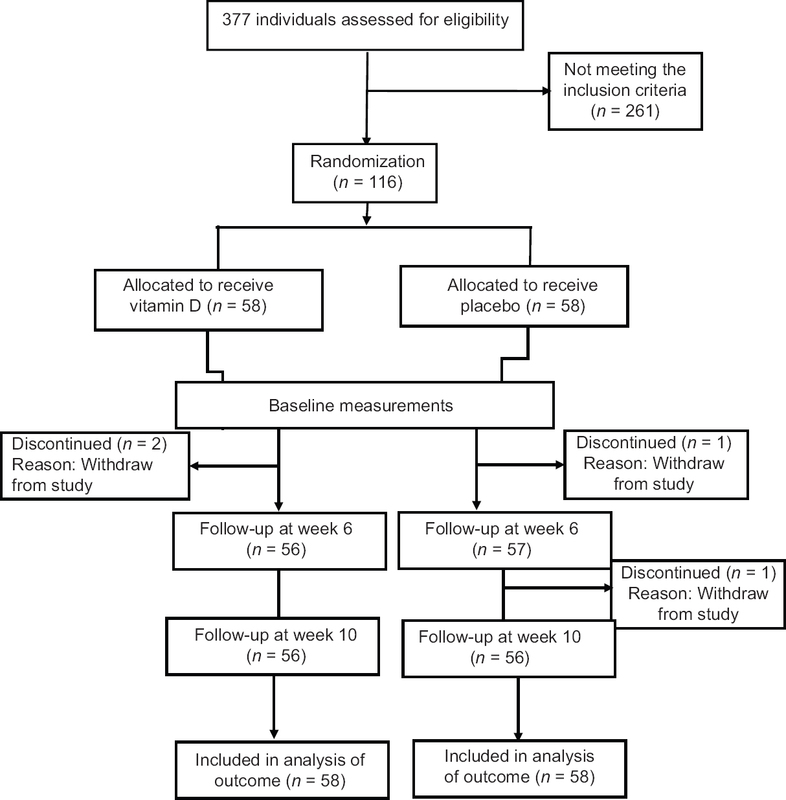 The purpose of this study was to determine the effect of vitamin D supplementation on anxiety, depression, and inflammation in diabetic women with anxiety. 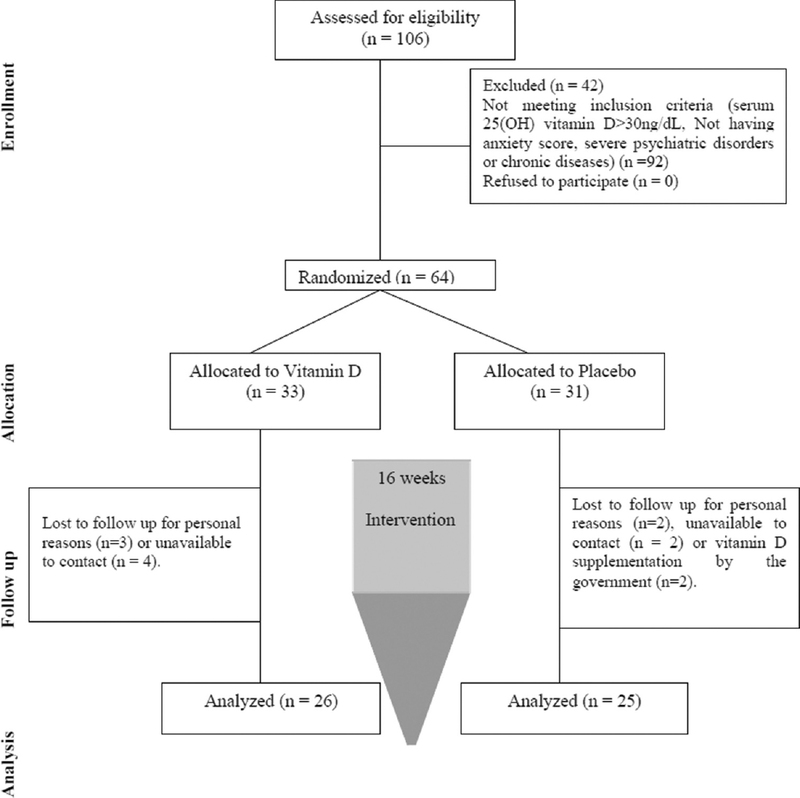 Methods: In this randomized controlled trial, totally 51 women with type 2 diabetes (T2DM) and vitamin D deficiency were randomly allocated to receive one oral pearl of 50,000 IU vitamin D3 (26 women) or a placebo (25 women) fortnightly for 16 weeks. Anthropometric indices, sun exposure, dietary intake, depression, anxiety, and stress scores and biochemical biomarkers including high sensitivity C-reactive protein (hs-CRP) and interleukin-10 (IL-10) were measured at the baseline and after 16-week supplementation. Results: Mean ± SD age of participant was 47.43 ± 9.57 years old. Baseline values were not different between the groups. Anxiety score changes were significantly lower in vitamin D group than the controls (P = 0.001). Within group comparison indicated that depression in supplement group with lower vitamin D levels was significantly reduced. Serum hs-CRP reduced (P = 0.01), while IL-10 concentrations increased (P = 0.04) in the intervention group. Conclusions: Vitamin D supplementation can improve mood status and anti-inflammatory biomarkers in female diabetics with anxiety and vitamin D deficiency. Background: There is no statement on the ability of obesity indices in prediction of lipid abnormalities among young adults. The present study was conducted to determine the ability of obesity indices as predictors of lipid abnormalities among a group of young adults. Materials and Methods: A total of 353 medical university students aged 18–25 years (188 males and 165 females) participated in this cross-sectional study in 2014. Weight, height, waist circumference (WC), and hip circumference were measured to calculate obesity indices including body mass index (BMI), waist-to-hip ratio, and waist-to-height ratio (WHtR). Serum total cholesterol (TC), high-density lipoprotein cholesterol (HDL-C), and triglycerides (TG) were measured by commercially available kits and were applied to calculate low-density lipoprotein cholesterol (LDL-C) and atherogenic parameters including LDL-C/ HDL-C ratio, TC/HDL-C ratio, non-HDL-C, and atherogenic index of plasma (AIP). Results: Subjects with BMI ≥25 kg/m2 had a greater value of all lipid profiles and atherogenic parameters (P < 0.05) except for HDL-C (P > 0.05) compared to subjects with BMI <25 kg/m2. In logistic regression model, BMI ≥25 kg/m2 was significantly associated with the highest odds for elevated TC (odds ratio [OR] = 7.67, P = 0.003), LDL-C (OR = 3.24, P = 0.01), TC:HDL-C (OR = 4.98, P = 0.01), and non-HDL-C(OR = 4.32, P = 0.001) in males, as well as high values of TG (OR = 8.80, P = 0.002), LDL-C:HDL-C (OR = 3.64, P = 0.01), and AIP (OR = 9.65, P < 0.001) in females. In terms of central obesity indices, males with WC ≥102 cm and females with WC ≥88 cm had the highest odds of increased LDL-C:HDL-C (OR = 6.71, P = 0.01) and TC:HDL-C (OR = 3.25, P = 0.050), respectively. In addition, females with WHtR ≥0.50 had the highest odds of high TC (OR = 3.56, P = 0.02) and non-HDL-C (OR = 2.70, P = 0.02). Conclusions: Overall, the findings of the present study showed that BMI was a stronger index for prediction of classical lipid parameters and atherogenic parameters than central obesity indices in medical students.